Protect your property with our video surveillance security camera solutions. Affordable and effective way to defend your home or business from crime. We use the latest Intelligent Security System platform, which provides the latest facial recognition and license plate recognition technology. LAN Solutions are an excellent addition to a workplace. Networks allow users to share software thus cutting down the expenses for computer equipment. P&O Global Technologies is a leader in surveillance camera systems, using the latest in CCTV, with more than 20 years on the market providing excellent service to our customers. 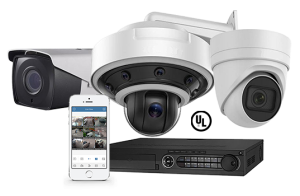 We can fit any budget and create a perfect custom package to fulfill your security camera needs to protect your business or home.